Comment: A drop of Big Sur to wear around your neck! Vesuvianite is also known as Idiocrase, Californite, or American Jade plus several other names when in different colors. This here is the classic form, including the green color zoning. 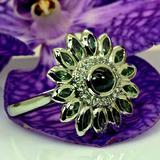 It is tough and durable for the use in jewelry, especially as pendants. The different images under varying light conditions show its habit to move between hues and tones, between moss green, grass green to a more aggressive yellow-green. The main image, and the handshots, were taken under natural daylight, indoors, and show the primary color character. Almost one inch in length, it will make a visible but not flashy, all-natural pendant, drawing attention only from those people you'd like to speak with. 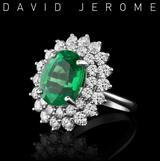 As always, our independent, scientifically correct, 3rd party laboratory report proofs, and documents for the future, that your jewelry contains only what you want and have paid for, and nothing else, no chemicals, dye or polymer, no lead glass not even simple green glass.